QMS is a small authority with a big responsibility – to regulate and advise the hugely important red meat industry across the whole of Scotland and encourage its sustainability and long-term prosperity. Morton Ward has worked closely with them since 2012 to produce their yearly annual reports. For 2016, we changed the format from portrait to landscape to meet their brief of creating a less corporate, more accessible document. The result was a bright, appealing new design with greater use of photography, infographics and short snappy texts to balance the organisation’s authority with a more enjoyable read for members and readers. We created a dynamic, eye-catching new grid and colour palette, with bold, at-a-glance infographics to highlight important information and bright, fun photos cut out throughout to add visual interest. We had other good reasons for the change in format – the new landscape design and paper stock chosen were more environmentally friendly to reflect the values of QMS. It also translates better to online presentation and reading, which has become a popular way for QMS members to access the report. 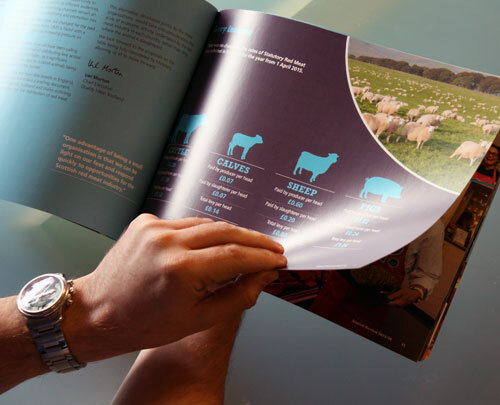 The final design met the brief perfectly, created with care to appeal to QMS members and industry insiders as a more informative, entertaining read, rather than a typical bland corporate report. We look forward to working with them again next year to continue this approach.